Aristide Bruant was a star of Montmartre. A singer and comedian, he appeared at clubs such as Le Chat Noir dressed in his trademark red shirt, black velvet jacket, high boots, and a long red scarf. 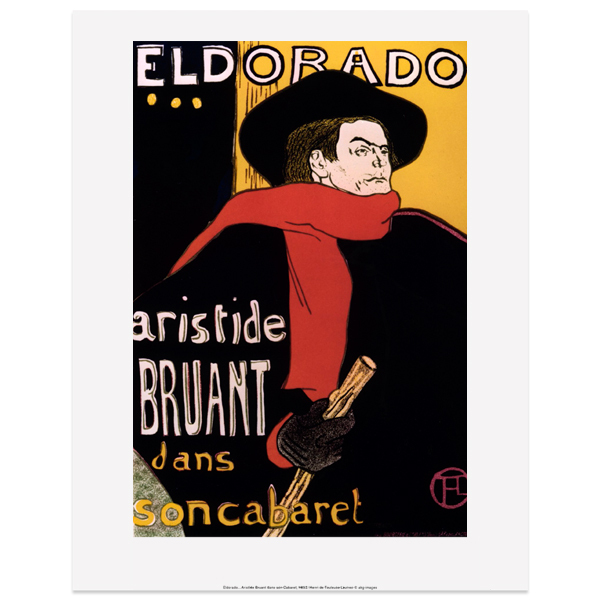 He was one of Lautrec's first friends among the performers of Montmartre. Toulouse-Lautrec became something of a celebrity in the Montmartre district of Paris where he lived and worked, relishing the hedonistic bohemian life there. His posters for famous performance venues such as the Moulin Rouge or the Jardin du Paris are some of the most recognisable images to emerge from fin-de-siècle France. Long hand woven alpaca scarf in vibrant red with black edge and soft fringes.